15k/150+150 ohm output transformer for driving a balanced ohm line from single ended triode stage. 100% M6 core for high level capability, Can be configured for 5:1 or 10:1 ratio. Max output level at 30 Hz +26 dBu. Multiple interleaved winding sections. for high bandwidth. Max primary dc 30 mA. Total dc resistance ref secondary 76 ohms. Size "D" Package options. Replacement for Chicago BO-1 in Fairchild 666. Suitable for Drip 666 board. 15k/417 ohm output transformer for driving a balanced ohm line from push-pull 6SN7, ECC83 etc. 50% Mumetal core for high bandwidth and dynamic range, Max output level at 50 Hz +32 dBu (30 volts). Total dc resistance ref secondary 31 ohms. Colour coded leads. Size A. Package style Coloured leads style "A"PCB pins style "B"Solder tags style "X"
10k CT/150+150 ohms Push-Pull output transformer. 100H primary. Up to 18mA dc.per side. Max 3 mA unbalanced permited. Max output +36 dBu . Can be configured as 4:1 or 8:1 to give high reflected load. Suitable for Federal AM 864 U compressor. Total dc resistance ref secondary 65 ohms. Colour coded leads. Size D. M6 core. Tested with Drip Electronics UA175 PCB. 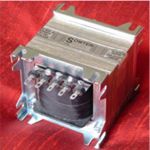 20k/150+150 ohm output transformer for driving a balanced ohm line from push-pull 6SN7, ECC82 ECC83 etc. 100% M6 core for high level capability, Max output level at 30 Hz +37 dBu. Multiple interleaved winding sections. for high bandwidth. Full geometric balance. Total dc resistance ref secondary 54 ohms. Package options. Size "D"
Package style Solder tags style "X"PCB pins style "B"Coloured leads style "S"
15k/150+150 ohm output transformer for driving a balanced ohm line from single ended triode or pentode stage. 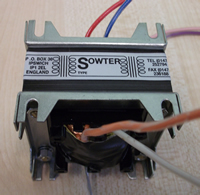 Very high primary inductance for driving from a valve with a high plate resistance (rp). 100% M6 core for high level capability, primary Inductance 100H. Can be configured for 5:1 or 10:1 ratio. Max output level at 30 Hz +26 dBu. Multiple interleaved winding sections. for high bandwidth. Max primary dc 15 mA. Total dc resistance ref secondary 131 ohms. 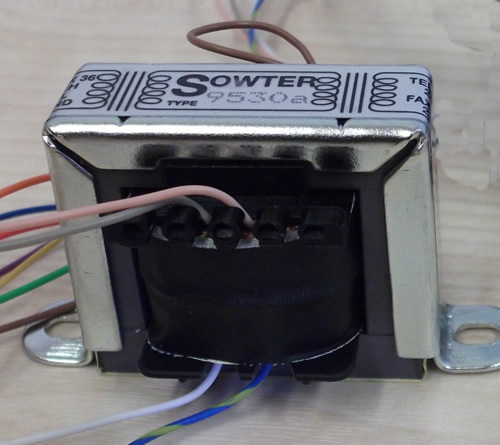 15kCT/150+150 ohm output transformer for driving a balanced line from push-pull triodes. 100% M6 core for high level capability and low distortion. Twin secondaries for 600/150 ohm outputs. Voltage ratio 10CT:1+1 Max dc per side of primary 30 mA. Colour coded leads. Size A Supplied with end frames for vertical or horizontal mounting. Fully shrouded style "S" option. 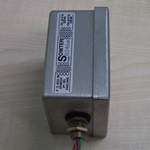 15k/185 ohm output transformer for driving a balanced ohm line from push-pull 6SN7, ECC83 etc. 50% Mumetal core for high bandwidth and dynamic range, Max output level at 50 Hz +28 dBu (19 volts). Total dc resistance ref secondary 14 ohms. Colour coded leads. Mumetal can with threaded grommet 45 x 72 x 63 mm. Tested with Drip Electronics UA 175 and Altec 436 PCB. 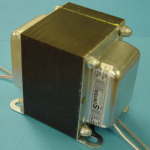 10k/600 ohms single ended output transformer. 40 H primary. Up to 30 mA dc. Max output +24 dBu (12 volts). Total dc resistance ref secondary 96 ohms. Colour coded leads. Size D. M6 core. 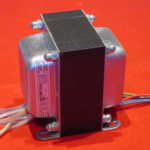 8k/600 ohms single ended output transformer. 50 H primary. Up to 45 mA dc. Max output +26 dBu (18volts). Total dc resistance ref secondary 93 ohms. Identical primary to 9040 but reduced ratio. 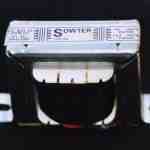 Will give greater output with slightly increased output impedance. Reflected anode load may be adjusted by using a secondary load reistance. Colour coded leads. Size H. M6 core. 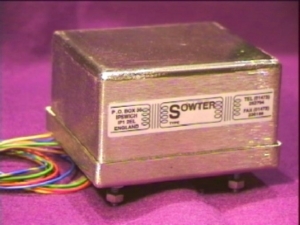 15k/600 ohms single ended output transformer. 50 H primary. Up to 45 mA dc. Max output +30 dBu (24 volts). Total dc resistance ref secondary 65 ohms. Colour coded leads. Size H. M6 core. 100% Mumetal, high ratio low cost transformer for interfacing between Digital/Analogue Converter to tube amplifier. 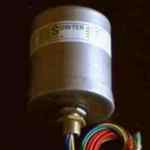 For use with a 100 ohm or less current to voltage conversion resistor. Can be configured ar 1:9 or 1:18 Mumetal can. For interfacing from a single or pair of Digital/Analogue Converters to a tube amplifier. Twin bifilar winding for driving with true and inverted data to give cancellation of unwanted quantisation products. Connect primary windings in parallel for normal use with a single DAC. For use with a 100 ohm or higher current to voltage conversion resistor on each DAC. Ratio 1+1:5+5. Mumetal can.